These games are a category of Kids Learning games. Let's now look at how to build the literacy board game - a learning game. Board Game creation - a learning game: Create a simple board game (a learning game) with letters, spellings and pictures to learn the English alphabet and spell simple words. 1. On a board make 9x3=27 squares with a pencil and scale. 2. Keep the first square on the bottom left-hand corner empty. 3. In each of the other squares paste a picture. 4. Each picture should have printed prominently on it: one of the letters of the alphabet say 'A', a word beginning with 'A' say 'apple', and the picture of an apple. 5. Paste pictures of a similar kind for all 26 letters of the alphabet randomly on the squares. 6. Make a die using a paper cube. On each face of the cube write four letters of the English alphabet randomly(not in any order). This way 24 of the letters would be written on the six faces of the dice. That is on each face there are four letters. On any one face write the remaining two letters of the alphabet. 7. Make 7 coins each for four players of different colours, (say blue, green, red and yellow) from laminated cardboard. Give one player say seven blue coins, the next one seven red coins and so on. 8. Two to Four players can play this game. 9. In this learning game let's use the model where four players are playing. The literacy game - a learning game: How to play it? 10. Begin with each player rolling the dice. 11. Whoever rolls the six letters side up, gets to play first. The rest of the players will then take turns to play in an anticlockwise direction. 12. When a player rolls the dice he puts his coloured coin in the box (on the board) which matches the first alphabet on the face of the dice that he rolls. 13. For instance if I roll the dice to a face that contains DKUE, then I place my coin in the box on the board which contains the letter D. If somebody else's coin is already there in the 'D box', then I put my coin in the 'K box' the next letter on the face of the dice. 14. If somebody has got a coin in all the four boxes represented on the face of the dice, then I do not get to place my coin and it becomes the next person's turn. 15. If one of the players rolls the dice with the six letter face up, she gets another turn. 16. Once all the boxes on the board are covered with a coin each, the number of coins that each player has placed on the board are counted. The player who has placed the maximum number of coins on the board wins this literacy game. 17. 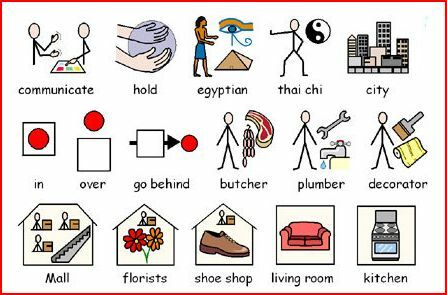 This is a fun way of recognising the letters of the alphabet, recognising the spellings of simple words as well as associating pictures with the letters, so that the learning is retained. 18. Learning like this makes the learning experience real. It teaches the alphabet in context. Let's now look at the second literacy game. It is also called 'memory'. It is especially useful for adults who have just begun to learn English. 1. Two to six players can play this game at a time. 3. Use a rhyme to decide who gets to start the literacy game. 4. For this page we will assume that the group is playing with random words. 5. The starter begins with a word beginning with 'A', say 'ape'. 6. The second person before saying a word with 'B' says 'ape' then her choice of word beginning with 'B', say 'bread'. The third person says 'ape', 'bread' before saying her own word beginning with 'C'. This way the game goes round. 7. When a player in this literacy game forgets a word that should have been in the sequence of the alphabet then that player looses and has to quit the game. 8. The literacy game continues until the letter 'Z' is reached or until only one player remains. All thse players who remain till the end are declared winners. To know more about how to use these games in different contexts go to the Contact us page and fill the form there. Fill in the form below and subscribe to the free learning games e-zine.